Mauritius is a small African island nation just east of Madagascar. Not the typical destination for a trip around southeast Asia. I mentioned before that our strategy was to just connect the dots on good deals on some flights around southeast Asia and while I was searching around I saw a promo for a new flight route on Air Asia to Mauritius with some prices I couldn't ignore ($300 return for a 7hr flight). In my excitement I literally drove straight over to bother Sasha at work so I could get her credit card and book it immediately. She was just a little shocked to see me but wasn't about to complain. And thus was born our little 5-day side trip to Mauritius. Sometimes it pays to be flexible while on a trip, sometimes you have to be flexible while still planning it. As it turns out that route was cancelled about 6 months later so you also need to know when to jump on these things right away. As a personal rough rule of thumb if I'm just passing through an island to take a look (as we were in this instance) then 4-5 days seems about right to me. If it is the destination and purpose, well, that's different. Mauritius is an island, and African, but it isn't mainland Africa and it has a whole lot of cultural fusion. Both the French and British controlled the island and both languages are still used today though creole is the most common. The British brought in a lot of indentured workers from India to work the sugar plantations after the abolition of slavery. In fact, Mauritius is considered to have been the model and testing ground for the system of indentured labourers from India which was later spread globally to such far flung places as Trinidad and Fiji. A huge percentage of the population now is of Indian descent from these labourers. Hinduism is the dominant religion (lots of temples) and Indian snacks are the most common street food (yum). It's a weird mix but nice as well. We couchsurfed with a lovely African lady and her family in the capital Port Louis and used it as our base to explore other areas. We had perfect warm and sunny weather so a short walk through town to the bus station (grabbing some dhalpuri takeaway for the road) and riding bus to a different corner of the island for a visit and back made for a great day. Of course we had to start with exploring Port Louis first. It is the capital and largest city, located in the northwest which is by far the most developed section of the island. It isn't huge, but it feels cramped, a little hectic and run down, but still very manageable and not unsafe. There is a small but nice new-looking development area at the Caudan waterfront where you can stroll, shop or find a trendy new restaurant. A little further north along the water is the Aapravasi Ghat, a relatively recently-listed Unesco site that preserves in a small free museum, the remains of the original wharf where indentured labourers first arrived and were processed. Also nearby is the small central market. Although there wasn't much to see, it was a good spot to get cheap local snacks and drinks. 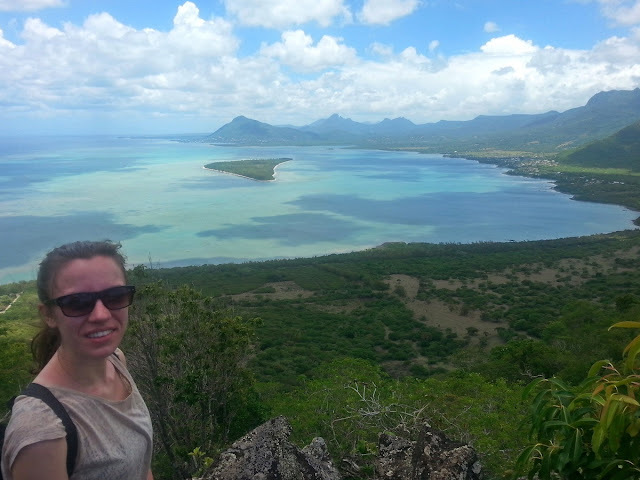 Behind Port Louis is a green mountain backdrop with a handful of trails good for an afternoon walk with our host. North of Port Louis is the primary tourist resort area so we avoided that and spent most of our days headed southwest instead. 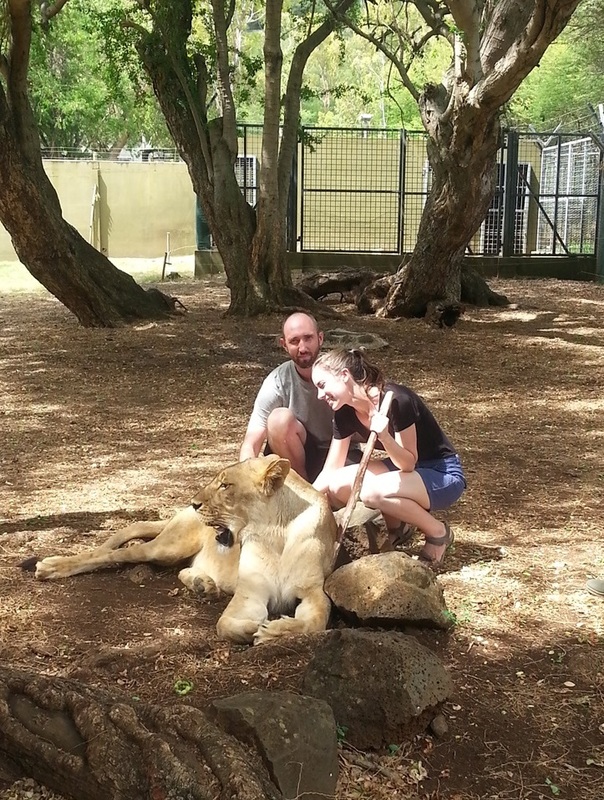 Savannah had been to Mauritius a few years before, loved it and recommended we visit the Casela wildlife adventure park. 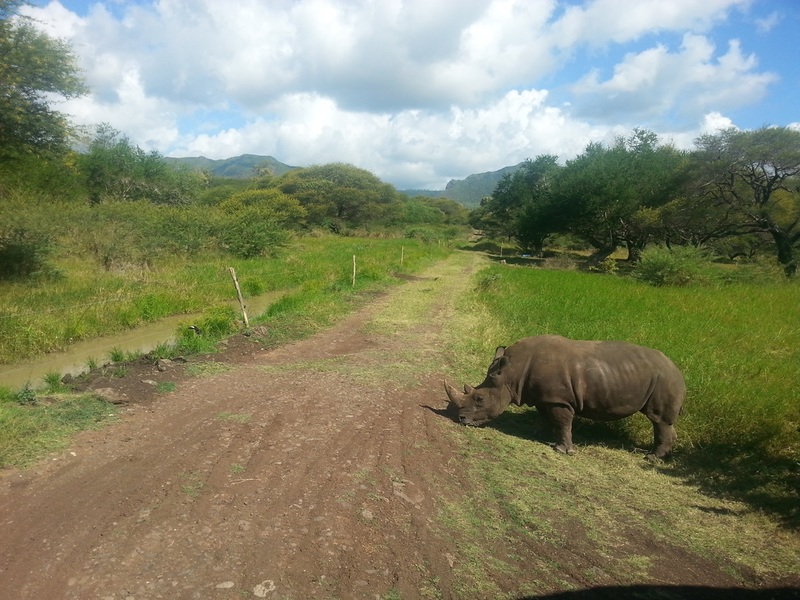 It is something of a cross between a zoo and a safari park. You can see quite a few different animals (mostly African ones), some in cages and some wandering around. 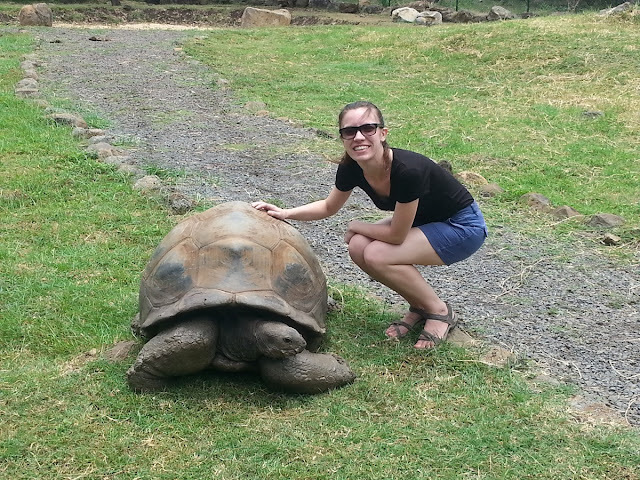 I don't think I'll ever forget the moment when the "rock" Sasha was staring at moved and she realize it was a giant tortoise! You can go on a short safari ride and for a little extra even pet or walk with lions. Of course we had to do that and I think the risk of Sasha spontaneously exploding out of sheer joy was much higher than and risk of a lion attack... Of course there is always some controversy with these types of things and talk of drugged animals, but the place comes across as very well run and maintained and definitely worth a visit if you can't get to the African mainland for the real deal. Near Casela is Flic en Flac beach. A great name for a great beach. It is popular but long and very relaxed with white sand and warm clear water. We were there mid-week so it was pretty quiet with a few locals lounging about. Flic en Flac beach with Le Morne in the distance. In the southwest corner of the island is Le Morne, a small mountain that was a popular hiding spot for runaway slaves who hid out in its caves. We took the long bus ride down (~2hrs) and then did a partial climb up the mountain. We were a little unsure about whether or not you can get to the top. It is fenced off though there are reports of guides and/or people getting around the fences that are at the upper sections. In any case, you have to register at the bottom with a little guard booth before you start up the trail. The view of the lagoon and all the windsurfers was fantastic from the height we got to anyway so we were more than satisfied with our efforts. Our last day in Mauritius we visited the town of Mahebourg and Blue Bay in the southeast to kill time before going to the airport nearby. It is also a very pretty area and if I visit again I would like to explore it more. It had a more relaxed and quieter atmosphere to it, though Blue Bay can get busy and has the odd tout for snorkelling tours. Overall, it was a great visit, people were nice, and it was easy to get help and get around though not always fast and efficient. Too bad it is too far away to go again easily.